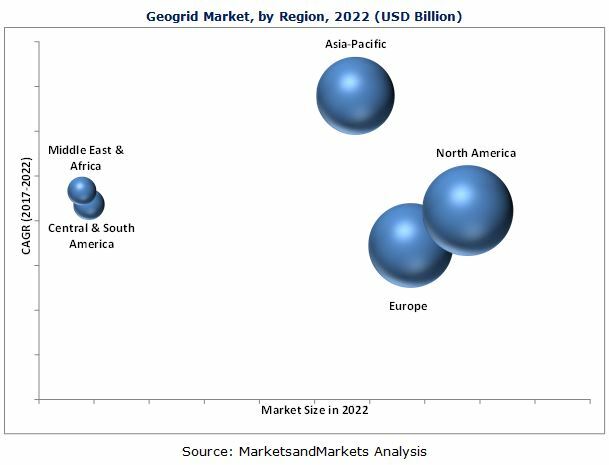 [148 Pages Report] Geogrid Market size was valued at USD 650.6 Million in 2016 and is projected to reach USD 1099.2 Million by 2022, at a CAGR of 9.2% during the forecast period. This growth can be attributed to the increasing infrastructural activities in the emerging economies. In addition, increased cost reduction in road construction and maintenance is a key factor driving the geogrid market. The base year considered for the study is 2016 and the forecast period is from 2017 to 2022. The report aims at estimating the market size and future growth potential of the geogrid market segmented on the basis of type, application, manufacturing method, and region. The base year considered for the study is 2016 and the forecast period is from 2017 to 2022. The report provides detailed information regarding key factors influencing the growth of the geogrid market. It also analyzes opportunities in the market for stakeholders and details of a competitive landscape for the market leaders. In addition, the report profiles key players and comprehensively analyzes their core competencies. This research study involves the use of extensive secondary sources, directories, and databases such as Bloomberg BusinessWeek and Factiva, to collect information useful for this technical, market-oriented, and commercial study of the geogrid market. In-depth interviews with various primary respondents have been conducted to verify critical qualitative and quantitative information as well as to assess growth prospects. Top-down and bottom-up approaches have been used to estimate and forecast the size of the geogrid market and estimate the size of various other dependent submarkets. The value chain of the geogrid market includes manufacturers such as Tensar (U.S.), Tencate (Netherlands), Maccaferri (Italy), Huesker (Germany), Naue (Germany), Pietrucha (Poland), TMP Geosynthetics (China), Wrekin Products (U.K.), Thrace (Greece), Carthage Mills (U.S.), and Bostd Geosynthetics Qingdao (China). This research report categorizes the geogrid market based on type, application, and region. The geogrid market is projected to reach USD 1099.2 Million by 2022, at a CAGR of 9.2% from 2017 to 2022. The growth of this market can be attributed to the rising use of geogrids in the emerging economies. In addition, increased cost savings achieved in road construction and maintenance activities with the use of geogrids is also anticipated to drive the geogrid market. Geogrids are used for various applications such as road construction, railroad stabilization, and soil reinforcement. Road construction is the largest type segment of the geogrid market. The use of geogrids provides the structure or area with improved road surface quality and safety of roads, low maintenance requirements, eliminated need of over-excavation and disposal of poor quality soil, high performance of earth moving vehicles, and resistance against bad weather conditions such as heavy rains. In addition, the use of geogrids is environmentally safe, as it helps in reducing carbon emissions. Based on type, the biaxial geogrid segment accounted for the largest share of the geogrid market in 2016. This growth can be attributed to the superior junction strength and optimum load bearing properties of the biaxial geogrid. Higher demand for geogrids for road construction is basically driving the market of biaxial geogrids at a worldwide level, as they are used in the construction of highways, flyovers, and bridges. Asia Pacific, North America, Europe, Central & South America, and the Middle East & Africa are the key regions considered for the market analysis in the report. North America is expected to become the largest market in 2022 with the countries such as the U.S. expected to upgrade and expand its existing infrastructure facilities during the forecast period. The market in Asia Pacific is projected to grow at the highest CAGR between 2017 and 2022, in terms of value and volume. The increasing demand for geogrids in infrastructural activities in the region is projected to boost the geogrid market growth. Lack of awareness of geogrids acts as a key challenge to the growth of geogrid market. The construction standards in the emerging economies do not incorporate geogrids as a basic construction material. In addition, improper quality control in the developing countries affect the overall geogrid market. Tensar (U.S.), Tencate (Netherlands), Maccaferri (Italy), Huesker (Germany), Naue (Germany), Pietrucha (Poland), TMP Geosynthetics (China), Wrekin Products (U.K.), Thrace (Greece), Carthage Mills (U.S.), and BOSTD Geosynthetics Qingdao (China) are the leading companies operating in the geogrid market. These companies are expected to venture into new markets to widen their customer base and strengthen their market presence. Other manufacturers of geogrids include Ace Geosynthetics (Taiwan), Asahi-Kasei Geotech (Japan), CTM Geosynthetics (India), Diamond Grid (Australia), GSE Environmental (U.S.), Low & Bonar (U.K.), Machina-TST (Belarus), Maruti Rub-Plast (India), Properx Operating Company (U.S.), Strata System (U.S.), techfab (India), and Tenax (Italy).